Technology being used to test for chinook salmon in Yukon waterways could impact private industry, government bodies, conservation groups and others, it was learned during a presentation at Yukon College Wednesday afternoon. Approximately 22 people filled a lecture hall to hear about the eDNA technology being used to look at the presence of chinook salmon. The technology, which has already been used to look at frog populations in British Columbia, allows for a non-invasive way of determining whether a waterway contains certain populations – in this case, chinook salmon, simply by taking a water sample. As it was noted in a statement by the college, it allows for a low-cost, non-invasive way to determine whether the population is in the area. 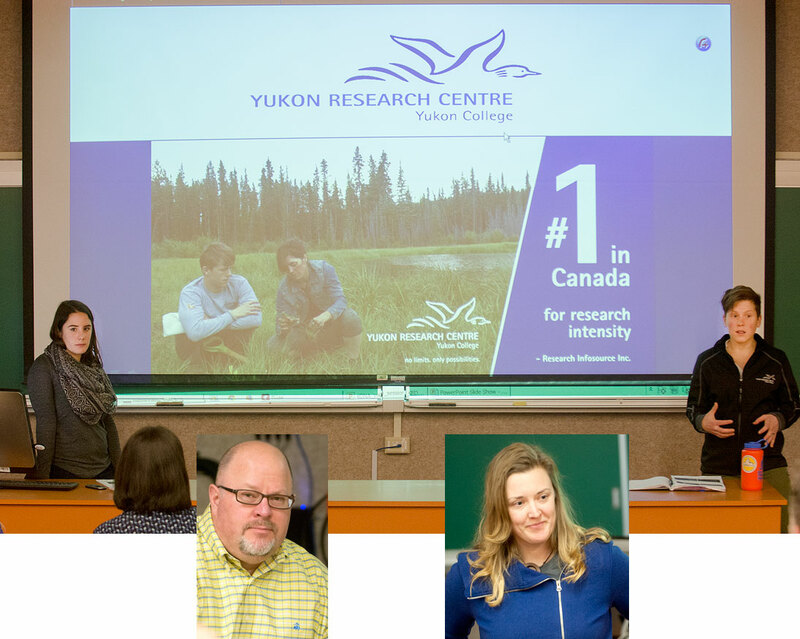 Partnering on the initiative is the Yukon Research Centre, based out of the college, and Hemmera, a local environmental consulting firm. “The technology’s still very new,” said Denise Gordon, a Yukon College student who has been among those working on the project. She described a fairly simple process where she and another student took water samples from the Teslin River, Nisutlin River and Kusawa Lake. The two rivers are known to have chinook salmon while the lake was a bit of a mystery, she said. Part of the project aims to determine that the technology is sound in showing that chinook salmon DNA is in water bodies known to already have a salmon population. After the samples were collected, filters were used to separate particles that could contain DNA. Ethanol was used to preserve the DNA within the filters. DNA was wrapped up and shipped to a lab at the University of Washington. There, they are being tested against a primer DNA sample for chinook salmon to determine if there is any DNA in the Yukon waterways. The technology is also allowing the samples to test for the presence of bull trout DNA. Gordon was quick to note the advantages of the testing. She pointed again to the non-invasiveness, the large window of time to collect samples and the lower cost compared to other testing techniques. “The project is still ongoing,” said Kristina Beckmann, an environmental co-ordinator with Hemmera, noting officials are awaiting results from the lab. Another presentation will be hosted in the spring to reveal the results. While the test can be used to find out if there are a species DNA in a body of water, both Hemmera and college officials stressed it will not determine finer details like how much of a population there might be, habitat location and so on. “It’s a tool,” said Michael Muller, project director with Hemmera. Its use could help organizations and industry decide if they want to move forward with a project based on if there is or isn’t a certain population of species found in the water. Rather than moving into higher-cost, more invasive tests and assessments to determine what may or may not be in the water, organizations could first do this test and decide whether or how to direct resources based on the results. Further detailed testing could then be done if needed. Officials with Hemmera and the research centre noted their hopes the technology will continue to improve so that eventually, more information on species population, habitats and the like can be obtained. Those taking in yesterday’s presentation were quick to point out as well potential impacts it could have on looking at species at risk and invasive species that may be moving north due to the changing climate, as well as the possibility of testing for diseases.